Why should readers be interested in your book, among the legions of books on the subject? We all know it’s better to teach someone to fish than simply give them some fish (and chips). While getting someone by is of service, teaching them to provide for themselves for years to come is a far greater service. But do we do this when it comes to doctrine, to the Christian faith? Most books on the atonement will lay out the material, the different theories and positions which attempt to explain why Christ had to die for our sins, and then argue for the pre-eminence of one of these. Some argue in favor of the ancient Christus-victor model, in which Christ defeats Satan. Others prefer some form of exemplarism, in which Christ provides a model or pattern of life before God which is so powerful that it guides, shapes and transforms us. Others still opt for a form of satisfaction theory, or penal substitution, in which Christ suffered the penalty of our sin, that we might be restored to a proper relationship with the Father. The primary way my book differs from others on the shelf is that it seeks to teach the reader to fish—to see how the doctrines of the Trinity, divine attributes and creation (to name a few) play an immensely formative role within the atonement, to appreciate how the history of Christian theology provides a virtually endless resource for understanding new aspects of the work of Christ, and to ultimately to be able to read Scripture in such a way as to more fully appreciate the host of ways in which it guides us into a fuller understanding of the work of Christ. Behind all this is an unbelievably rich understanding of the work of Christ. The atonement, I argue, is as rich, diverse, abundant and complex as the triune God himself. This means that we can and should devote our whole lives to understanding, basking and delighting in this work. And to do so, we need far more than a “theory,” far more than a few key biblical passages. We need to be equipped with a combination of Bible, church history, and theology, to have the necessary tools for this life-long exploration. My hope is that this book is different from its peers, in more aggressively seeking to provide the reader with precisely such a vision. What is the most counterintuitive part of your book? Daniel, the Karate Kid, was immensely frustrated with Mr. Miyagi—he wanted to learn Karate, and all he was doing was sanding and waxing. The most counterintuitive part of my book is the argument that in order to have a proper understanding of the atonement, one should not simply go to those passages which speak about it in Scripture (Lev. 16, Is. 53, Mark 10; Rom. 3; 2 Cor. 5, etc. ), not go to the church fathers (Athanasius, Thomas, Calvin, Barth, etc. ), but go to the doctrines of the Trinity and divine attributes. This is, after all, the work of God incarnate. So before we jump ahead to answering the typical questions, the best way to start, to situate and equip ourselves, is to consider what it means for this to be God’s work. I explore a host of implications throughout the book, but one of the ones I find most exciting and compelling is the fact that God is simple. Though God is loving, just, merciful, wise, omniscient, omnipotent, etc., he is all these things as a God who is one, simple and undivided. None of this is revolutionary, of course, until you start to notice the ways that theologians give pride of place to a divine attribute. Every theory of the atonement depends upon and highlights some divine attribute. Penal substitution, for instance, emphasizes God’s justice (and righteousness). And God is just and righteous—but what happens if we replace those terms with a corresponding emphasis on the holiness of God? A very different picture emerges, though one which is just as true to Scripture, in which the holy God sends his Son to take upon himself our uncleanness, that we might be made clean through the power of his resurrection and the sending of his Spirit. I unpack these matters at some length in my book, but suffice it to say that careful attention to the role of the divine attributes and doctrine of the Trinity within the doctrine of the atonement revolutionizes our understanding of the doctrine, enriching and expanding our understanding of the work of Christ. How will this book help pastors, and those in Christian ministry? Pastors are caught within the fruitful tension of preaching the Word of God, and proclaiming the Gospel message to their congregations. But not every passage of Scripture offers a fruitful engagement with the atonement as we typically understand it (penal substitution). My hope is that this book will equip pastors in the art of interpreting Scripture theologically, helping them to see a far greater range of ways that Scripture speaks to Christ’s saving work, better enabling them to live within the fruitful tension of their calling. One example will suffice. We typically think of sin as a matter of guilt—violating God’s law in a way which brings about punishment. But such a view of sin presupposes thinking about God in his justice. And of course God is just, and we should think about sin in this way. But God, in his oneness and simplicity is both just and wise. But when we think about sin from the standpoint of divine wisdom, it calls to mind the folly resounding throughout the Proverbs, and wisdom literature generally in Scripture. And how does Christ relate to our folly? He bears it and its consequences, that we might be made wise in him. Though Proverbs may offer little room for unpacking penal substitution, it is laden with material for exploring the nature and consequences of our folly, which we can then unpack through the substitutionary role of Wisdom incarnate, who trod the way of the Harlot’s house for us (Prov. 7:27 – “Her house is the way to Sheol, Descending to the chambers of death), that we in turn might be established in Christ as a house built on a rock. Scripture, in sum, is replete with a manifold and abundant witness to the work of Christ. Careful attention to the inner, theological, logic of the atonement will equip us to see and employ these resources, for a richer and more powerful proclamation of the Gospel. What would you want every seminarian to know about the atonement? I tell my students that if they hope to get divorced some day, they need to get married first. Jesus did not come to die for our sins. He came to rise from the dead, that we might be raised with him. The atonement, more than anything, is about the resurrection. Of course, if you want to rise from the dead some day, you need to die first. The death of Jesus is a vital part of the Gospel – there would be no good news without his substitutionary death. But this is not all. This is not even the majority of the story. According to Paul (1 Cor. 15), if we stop there, we are fools, and still in our sins. The real good news is the fact that Jesus rose from the dead. My hope is that every graduate from Talbot will rejoice in an understanding and appreciation of the meaning and significance of Jesus’ resurrection: the way that it gives a fundamentally positive and joyous shape to the Gospel; the way that it reframes and constrains sin, death and the devil within a broader frame of reference; the way that it demands that we see God’s attributes not merely in their mode of activity against sin (judgment, cleansing, destroying), but first and foremost in their proper, creative and life-giving mode; the way that it helps us see the work of God from creation to re-creation as a continuous, united and consistent work, as the same God who brought us into existence now calls us back into the fullness of existence with him, as those equipped and called once more to faithfully image him. 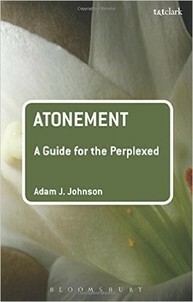 Click here for a copy of Dr. Johnson’s book, Atonement: A Guide for the Perplexed, available July 16. He has copies in his office available at a discount ($22). To download the first chapter of the book for free, please visit his website and sign up for his newsletter. See also Fred Sanders’ review of Adam’s book: Unperplexed about Atonement.